If you have ever wondered how to make wall crosses with beads and wire, wonder no more. Whether to give as a gift or to keep for yourself, a bead and wire wall cross is sure to be a keepsake for years to come. Usually available in sizes between 12 and 24 inches tall, these crosses are usually handmade and one of a kind. With that uniqueness, comes a hefty price tag. To cut down on the expense and enjoy a bit of your own creativity, opt to make your own. Beading Magazines provide a plethora of ideas and contain advertisements from national manufacturers. Bead Stores are boutique shops that specialize in unique and hard to find beads. 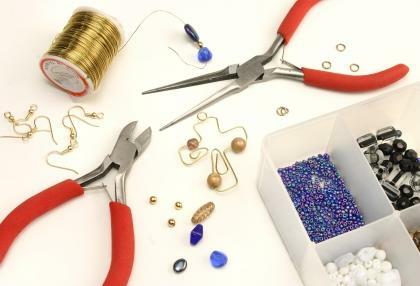 Beading Parties are similar to Tupperware or Avon parties of the past. A consultant will come to your home and showcase beads for order. For a closer to home option, consider your local arts and crafts store. Most national retailers like the ones listed below offer a bead section online and in their stores. First, you need to decide on how large a cross you want to make. If it is for yourself, measure the wall where you intend to hang it to make sure you make it large enough. If the cross is a gift, and you are not sure where the recipient will hang it, consider an average size of approximately 18 inches tall. This will be large enough to hang by itself but not so large that the cross could not be part of a wall collage.Another decision you need to make is the color. Rustic crosses are typically constructed from brown wire and neutral colored beads made of wood or matte finished glass. For crosses that are more contemporary, choose wire and beads that match the decor of your room or purchase shiny gold and silver beads for an elegant, formal look. Cut a piece of wire twice the length of your planned finished cross using wire cutters. Cut a second piece of wire eight inches shorter than the first. Fold the first length of wire in half with the loop at the top. Repeat with the second length. These two pieces will be the base cross form for the rest of the wire and beads to wrap around. Hold the longer length in your left hand with the wire spool in your right hand, start to wrap wire around the length from the bottom up. Depending upon the thickness of the wire you purchased, you may need to use your pliers to get a tight wrap. Continue wrapping until the bottom portion is covered. As you move your way up the cross base, you can string beads at random intervals for a whimsical look. For a more formal look, string beads in a set pattern. When you have reached the point where the shorter length needs to be attached horizontally, wrap the wire spool around both pieces in an "X" pattern to add stability. When finished, the horizontal piece should not be movable. Continue wrapping and stringing beads until you reach the top. Snip the wire from the spool using wire cutters and tuck the end into the cross using your pliers. If additional embellishments are desired, string a number of beads onto a separate length of wire then wrap around the center of the cross in another "X" pattern to secure. Make sure all of the wire ends are tucked securely into the cross structure so they do not scratch or mar the walls. You will not need to create a loop at the top of the cross for hanging because there will be spaces between the wrapped wire where the cross can be hung from a nail or hook. Now that you have learned how to make wall crosses with beads and wire, other wire and bead crafts should be a snap.